It was exactly a year ago today that I posted my review of Neil McGarry & Daniel Ravipinto's debut novel, The Duchess of the Shallows. That was a character-driven, tightly-plotted fantasy novel that was propelled along by an intriguing central mystery. It took the guys a while to find their stride and really settle comfortably into the novel, but it all paid off in the end. I am pleased to say The Fall of Ventaris picks up right where the first book left off, with the world already established, Duchess at the height of her game, and the guys already at full stride. There's nothing drastically different about this second volume in terms of tone or theme, but that's a relief, not an issue. What is different this time around is the layers and the complexities - there's even more than in the first book, and they're even more carefully intertwined. On the surface, Duchess gets herself even deeper into the political, religious, and cultural machinations of the city. She's a bit wiser than before, but still just as reckless and desperate for approval. Jana, a Domae weaver, is the strongest and most interesting addition to the cast, both for the way in which she allows Duchess to reveal herself, and for the development of her character itself. As for Lysander, I was concerned about what McGarry & Ravipinto could possibly do with him, given how his role in the first story ended in such a sacrificial betrayal, but I think they do a superb job here of exploring the implications of that, and in transforming his relationship with Duchess. Beneath the surface - quite literally - we're provided with a deeper glimpse of the mysteries and the horrors that underlie the city. Of those horrors, the facets are by far the most interesting . . . and the most chilling. A coven of priestesses with a shared sort of mind, their masks may never slip, but their solidarity does, setting up one of the most brilliant scenes in the novel. The climax of the ring caper, by comparison, isn't nearly as effective, but it still works. There's a lot going on here, and reading the story does demand a certain commitment that casual readers may find hard to involve themselves in. While it is largely a linear tale, with one event progressing from another, there's a lot of overlap, the Duchess juggling as many tasks and assignments as the reader does threads. 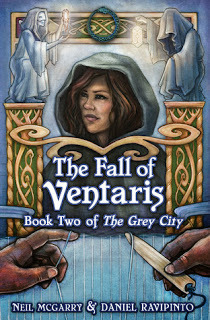 Deeply layered and richly detailed, The Fall of Ventaris not only offers a satisfying follow up to the first tale, but makes the reader hungry for more. I've had the first book in my TBR pile for a while now, the covers are so gorgeous. Might have to bump it up now!